Bringing Pepita to live was a surprisingly simple and fun challenge. When I was initially envisioning the outfit, I just knew I wanted to have a hoodie in case it rained or was cold. I wasn’t sure how people would know I was Pepita beyond this though. 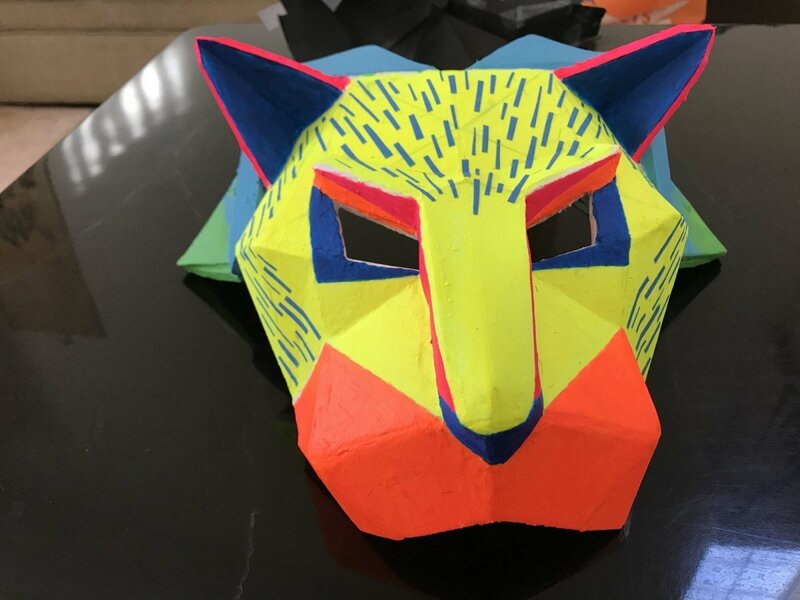 I ended up settling on creating a geometric mask to both convey Pepita-ness and fit the creativity and energy that is EDC Orlando. I knew this mask couldn’t just be made out of paper. Because of people dancing and moving around, I wanted it to be durable. I decided to also make it out of thicker craft foam. I started with paper; putting pieces together, taping, and cutting until I had a rough shape that I liked. I then traced this pattern out on my computer and printed out the more fleshed out design. Cutting and taping some more, I was able to have a clearer picture of what Pepita might look like. I went through two more iterations of just paper-forming until I was happy with the shape. Eventually, I got to a point where I could transfer the design onto 6 mm foam. To do this, I just out my shapes along the outside. I first used a pencil to trace the outline of the shapes. I then used a straightedge and pencil to mark any folds that would need to be made, differentiating between valley and mountain folds. Finally, I cut out the shapes and scored along the fold lines using the straightedge. Occasionally, I would need to slice through more than once because the foam was on the thicker side. Below is cut and scored piece of the mask. Notice the valley folds being made in the large polygonal piece created by scoring on the back. I numbered the different pieces to make sure I would be attaching the correct edges together. Using strictly masking tape, I assembled the foam pieces together. Any time you see a mountain fold on top, there’s a piece of masking tape on the back holding the edges together. This particular piece of foam looked like someone stepped on it, but I knew it wouldn’t matter as I would be painting on it. Here is a photo of the nose being cut out and scored. Because the cuts were so small, this was probably the most difficult part to cut. Eventually, I had a fully assembled mask. Next I went through the process of finishing the mask. I first used hot glue to fill in large gaps in the mask. Taking care not to put too much hot glue in the gaps, I filled the rest of the gap space up with DAP. I went through a bunch of popsicle sticks making the DAP in these gaps smooth. A tip for anyone filling in the mask this way, the cleaner your popsicle stick is, the better your result will be. DAP also can rub off nicely, once dried, with your finger so you’re left with a smoother surface. I spent some time on the process of smoothing, rubbing, and sanding before I was happy to move onto painting. In retrospect, my Pepita mask has a slight gap in some places. If you have more time for drying and smoothing, the end result will look that much better. Knowing that foam loves to eat paint, I applied a coat of Mod Podge before painting. Not really knowing how the acrylic fluorescent paint I got would apply, I decided to go with the darkest color first. This was a good idea as it showed that for me to have a nice consistent look, I would need multiple layers of the acrylic paint. Just wanted to show off some Halloween cookies I made on the side. Eventually, I discovered that it was much easier to paint darker colors over the lighter paints. I painted yellow over the rest of the mask and applied strips of painters tape that I pressed firmly onto the mask. After taping everything, I added the green on top of this. As green was a darker color, I had to do something like five coats to make the color consistent. When painting, I never used too much paint at a time. After a while, I was mostly spending a few minutes here and there just touching up the paint job. After removing the strips of painters tape, I was done. Here is the completed result in the light. …And in the dark with a black light applied. I also patterned out a mask for Dante. The paint job and rest of Dante was completed and worn by @garchiu. Here’s a few more shots from EDC Orlando! Hope you enjoyed this breakdown of how I created my Pepita mask. If you’re interested in the pattern for either masks, shoot me a message!